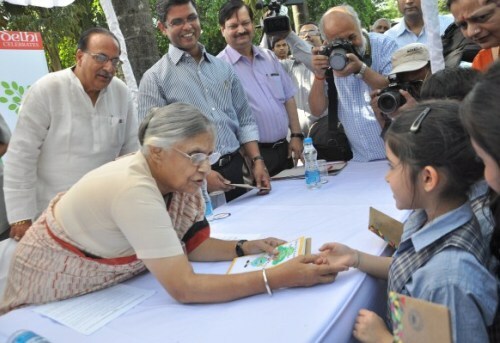 Chief Minister of Delhi Sheila Dixit ma’am encouraging school students during Earth Day 2007. CM’s green agenda has greatly contributed to increased environmental awareness in the students. Children, by their very nature, are impressionable. Right from bare infancy to early adulthood, the experiences that the child undergoes lays the foundation for her core value system. This is because it is only during these early years that the mind is extraordinarily open to learning and assimilating knowledge. Therefore, in today’s fast-moving and goal oriented world, inculcating environmental values into individuals when they can be taught best is of utmost importance. Consequently, Environmental Education is a vital part of education as it not only encourages awareness of the natural world but also leads to an understanding of contemporary environmental problems. Here, it needs to be mentioned that care for the environment is deeply rooted in the Indian way of life. Indian folklore, and the values and cultural mannerisms imparted through it, have always promoted harmony with the environment. The Vedas and all other religious texts arising from India emphasize on the small stature of humans in the infinitely large and complex “surroundings”. The Vedas also highlight the need and responsibility to protect nature. The Indian constitution has captured much of the essence of these deep-rooted values and has given responsibility to the citizens to protect the environment. In 2005, the Supreme Court of India directed all educational agencies in the country to make environmental education a compulsory component of primary and secondary education. In response to this, the NCERT took a number of initiatives to give stronger footing to the still nascent environmental education across affiliated schools all over India. The most important among all initiatives was the setting up of National Curriculum Framework 2005 which incorporated the study of the environment as a part of various subjects. An ingenious solution, it led to the development of detailed curriculum, guidelines and model syllabi for classes 1 to 10 that reflected the new environmentally conscious ideas. Environmental education at primary, secondary and higher secondary levels has been approached in different manners in this National Curriculum Framework. At the primary stage, Environmental Education is imparted through EVS (Environmental Studies), which forms a common component of the syllabi of classes 1 to 5. For classes 6 to 10, the NCERT textbooks of science and social sciences include an extension of environmental concepts taught earlier through extra chapters focusing on the subject. For students of classes 11 and 12, the majority of the environment related concepts are found in the textbooks of biology, chemistry and geography, all elective subjects. As an intern at Delhi Greens, I went around reviewing the status of environmental education at various schools in Delhi. It was found that at the primary level, Environmental Education is given the requisite importance in primary school and EVS is considered to be a key subject. However, with the increase in class level, the significance of Environmental Education declines. Often, chapters related to the subject are taught by teachers at the end of the term; once they are done with the “real” syllabus. And sometimes, the students are told to just go through them and rote learn them for the examinations. This approach may work for subjects that are more theory oriented but for environmental education dialogue and project work are much more cardinal. However, all is not bleak. There is indeed a silver lining. Even though the content related to environmental education in school is often not given a priority, its introduction into the curriculum has had some significant positive impacts. For one, the number of extra-curricular activities such as campaigns related to the subject has increased manifold. Every school in the city is now hosting cleanliness drives, small poster making competitions, debates and green technology ingenuity symposiums. While there is a need to upscale Environmental Education at the Class 11, 12 level, the existing momentum of green activities needs to be maintained as well. We at Delhi Green Blog are delighted to see our cause of environmental protection gaining momentum in the Delhi schools. The present article is part of a three part series on surveying the Environment Education landscape at school, undergraduate and postgraduate level in the NCT of Delhi. Good analysis work, children are the future of the planet. Thankfully they are smart to know that and are taking charge early on. A very interesting and insightful article. I’m not familiar with the school system/board in Delhi but I’m surprised that in this day and age of environmental consciousness there is no dedicated subject for Environmental studies in the high school and higher secondary school levels. I don’t know how it is with other State boards and the CBSE but CISCE at the ISC level (11th and 12th) has a compulsory Environmental Studies paper. And yes, you have a very real point there, rote learning serves no purpose. The love and concern for the environment can only come from really experiencing nature and knowing it outside the class rooms and books. Great compilation Diksha! Feels great to know that environmental education is imparted at such an elementary level and will help them to make a better future for themselves. You write remarkably well. I hope your article will go a long way in shedding light on the status of Environmental education at the elementary level. Great job Diksha. good work, however the real purpose can be more efficiently served, if the young school students are more encouraged to understand , and do a little bit to the environment, in their school, home and society.